President Donald Trump has received 92 percent negative evening news coverage from the main broadcast networks of ABC, CBS, and NBC. 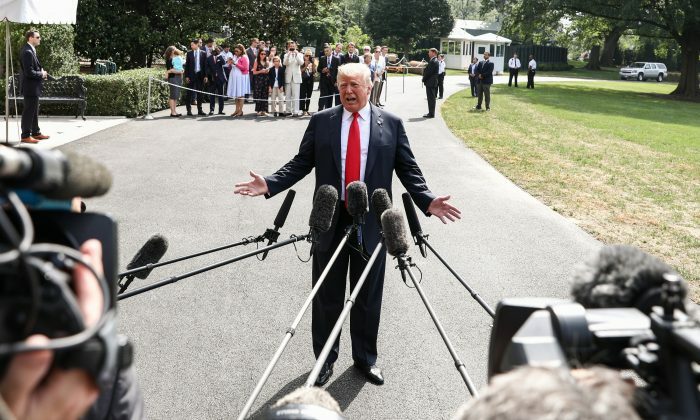 “Over the summer, the broadcast networks have continued to pound Donald Trump and his team with the most hostile coverage of a President in TV news history,” Rich Noyes of the Media Research Center (MRC) said in an Oct. 9 article. Not only did the MRC find the coverage overwhelmingly negative toward the president, but it also highlighted a lack of diversity among its topics. “Over the past four months, nearly two-thirds of evening news coverage of the Trump presidency has been focused on just five main topics: the Russia investigation; immigration policy; the Kavanaugh nomination; North Korea diplomacy; and U.S. relations with Russia,” Noyes wrote. The mainstay of news was the Russia “collusion” story, focusing on the investigation by special counsel Robert Mueller. Mueller is probing reports of Russian interference in the 2016 election and “collusion” by the Trump campaign. While Mueller has indicted some two dozen Russians for election meddling, any Trump campaign involvement remains unsubstantiated more than two years after the FBI probe first started. That didn’t stop the networks from dedicating almost 33 hours of evening news to the story since Trump’s inauguration, including 342 minutes this summer, of which 97 percent was negative toward Trump. “Almost none of it has focused on any of the controversies involving Mueller or his investigative team,” Noyes noted. Trump has called the investigation an illegal “witch hunt” led by “17 angry Democrats.” Most on the Mueller team are veterans of the Obama administration and the majority are donors to the Democrats. Congressional Republicans are meanwhile investigating whether the Obama administration used the Russia collusion narrative as a pretext for its large-scale spying operation against the Trump campaign. The Justice Department’s inspector general is expected to release the results of his probe on the matter later this year. The networks’ second-most favored story was Trump’s immigration policy, with 308 minutes of 94 percent negative coverage. Most of it was, however, concentrated in June. After the administration called for all adult illegal border crossers to be prosecuted, around 2,000 children were temporarily separated from their parents while the parents awaited prosecution. The networks responded with 250 minutes of seemingly endless coverage, but when the administration decided to keep detained families together where possible, Trump’s immigration policy nearly vanished from the news, with 35 minutes in July, 18 minutes in August, and just five minutes in September. What came instead were 291 minutes of reports on the Senate confirmation of Trump’s second addition to the Supreme Court, Justice Brett Kavanaugh. Most of the coverage was negative, with 83 percent against Kavanaugh and 82 percent against the Trump administration’s handling of the nomination. Trump announced the nomination on July 9, but the networks largely ignored the ensuing Senate confirmation hearings, offering just 32 minutes of coverage by Sept. 6. That changed on Sept. 13, when the allegations of Christine Blasey Ford surfaced. Ford said Kavanaugh sexually assaulted her 32 years ago when both were in high school. There was no corroborating evidence to her accusation, and multiple inconsistencies emerged in her eventual Senate testimony. But the networks offered hours of coverage to her claims, also repeating other unsubstantiated accusations, such as a claim that Kavanaugh abetted gang rapes of high-schoolers in 1980s that nobody ever reported or discussed despite dozens of alleged witnesses. “It is impossible to recall the networks ever giving publicity to a more damning accusation that had not either originated from law enforcement or at least been corroborated by journalistic investigation,” Noyes said. As it turned out, Sen. Dianne Feinstein (D-Calif.) was aware of Ford’s accusations for months, but withheld the information until after Kavanaugh’s confirmation hearings, apparently to delay the nomination. Right after Kavanaugh’s confirmation, Ford’s lawyer said she doesn’t plan to pursue the allegations any further. Lower on the list of priorities for the networks was Trump’s breakthrough in relations with North Korea. After Trump’s historic meeting with the North Korean leader Kim Jong Un in June, both countries agreed to work toward a complete denuclearization of the Korean peninsula. After some relatively positive coverage of the summit, the networks switched to criticizing Trump for not resolving the decades-old conflict fast enough, resulting in 179 minutes of coverage that leaned 90 percent negative. Trump said he’s giving the issue as much time as needed, pointing out that the communist dictatorship has meanwhile stopped nuclear and missile tests, and instead regularly talks to his administration. The media churned out 151 minutes of coverage on U.S. relations with Russia, 99 percent of which was negative. The majority of the coverage was centered around Trump’s July 16 meeting with Russian President Vladimir Putin. The media asserted that Trump didn’t confront Putin sufficiently on the election meddling. Peppered over the four months was 14 minutes—0.7 percent—of coverage for the booming economy under Trump’s tax cuts and deregulation, which was 89 percent positive. The networks gave more time (80 minutes) to Trump’s push for better trade deals through tariffs, but focused on the downsides, like potential higher costs to consumers or harm to industries that rely on imports, instead of the potential for job growth or higher wages for American workers. The resulting coverage was 88 percent negative.